The Avengers Assemble with Santa Claus? It is a ridiculous concept, yet Rise of the Guardians is so nice to look at and has enough smart dialogue to rise from mediocrity. Our story follows Jack Frost, a newly awoken “Guardian”, a Guardian is one of the many mythical characters from fairy tales who do indeed exist, and protect the children of Earth from evil. The young Jack must discover his true potential to help Santa Claus, The Easter Bunny, Tooth Fairy and Sandman battle the Boogeyman known as Pitch Black. The film is a straight up action movie; it barely stops for breath! Since we follow Jack and his impish antics merge with the quirky otherworld of the Guardians (rather than following a human child’s perspective, for example) and the story becomes a mash of dazzling visuals and quite excellent animation. The frost effects are exceptionally well done. The characters are all instantly enjoyable and very unique. Frost himself is young and impressionable, Huge Jackman plays the unlikely role of the Australian Easter Bunny (!!) while the Tooth Fairy proves to be most compelling. However, special mention has to be given to Santa, a Russian Santa! He’s a jolly bruiser. The Guardians relationship with the human world is interesting too and how, like the Greek gods of Olympus have been depicted, rely on human belief to sustain their very existence. This is balanced well with the happy-go-lucky antics the Guardians have with children! There are genuinely funny moments and quips throughout the film. 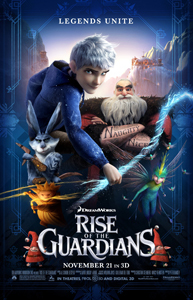 So what’s wrong with Rise of the Guardians? It really is a frantic overflow of visuals, beautiful visuals, but there isn’t much meat to the characters’ dilemmas, at least these aren’t played out as fully as they could have been. Jack Frost is regarded as a “neutral party” only… he is clearly one of the good guys. The villain Pitch Black felt pushed aside, and while he was threatening (at least when compared to the fleshed-out, adorable heroes and their sidekicks) I felt genuinely sorry for him by the end. Another thing that was a little pestering was some lack of consistency with the fictional “lore”. Guardians have no power when no one believes in them (to the point where humans cannot see them) our heroes are seen severely weakened and unable to fight later on. Yet Jack Frost as a new Guardian (no belief; cannot be seen by humans) has the power to repel Pitch Black immediately. No explanation. But, it is a good fun romp! Don’t be put off by the laughable concept, Guardians is a fun ride with a ton of creative visuals and loads of excellent designs. Its no How to Train Your Dragon, but with snappy dialogue and the chance to show loved characters in a new light, it is harmless entertainment. Additional Marshmallows: While I did not see this in 3D, I can say that it didn’t suffer from “gimmick” shots in 2D; I wasn’t punished for seeing this film normally! That said, I could imagine it looking good in 3D, there are a lot of sweeping aerial shots that allow for depth-of-field, and plenty of particle effects that can be pushed forward nicely.